OK - so you're considering an air fryer, but you're not sure which one to get. This guide can help. I'm going to use my experience air frying to help you pick the best air fryer for tofu in 2019. My top best air fryer picks for tofu in 2019. Do air fryers live up to the marketing hype? Should you even get one? How different brands and models compare to each other. Which features are important and which aren't. In a hurry? Here are the top picks for tofu in an easy to follow comparison table so you can check them out quickly. Mobile users can scroll left and right on the comparison table below. Price ranges are subject to change. *Consider getting a third party warranty from the retailer you purchase from as they tend to be easier to deal with and affordable. Should You Even Get an Air Fryer? What Have Others Said About Air Fryers? What Makes a Good Air Fryer? In my experience, air fryers are nice, but only if you don't have a convection oven. At the end of the day an air fryer is nothing more than a counter-top convection oven with a basket and possibly some other accessories. However, if you live in a small apartment, college dorm room, or don't want to buy an oven with airflow, then it certainly might be worth it for you. Cooking with less oil is great and I'm all for it. Just don't expect it to do anything magical. There's a lot of marketing hype surrounding these things, but I haven't found that mine does anything exceptional that I can't do in the oven. But they are especially good for tofu because of the convection aspect. It helps get the water out quickly so the texture becomes crunchy and crispy. In this article, the Wirecutter wasn't that impressed with what air fryers had to offer for their cost. They also did a fry cooking experiment and noticed that the Philips produced the best result and weren't happy overall with how they performed. Overall, I agree with their assessment that these products are slightly over-hyped but I don't think they are useless. Like I mentioned, if you don't have a convection oven and have a small space it may be worth the investment. This is especially true considering that the prices on many of the brands have come down over time. Whether or not foods cook evenly is heavily determined by how the food is distributed in the basket and whether you move it around during cooking. From my experience, this isn't that big of a deal. It's like tossing something in a pan. Sure, the different brands have slightly different mechanisms of distributing the air (Philips has their patented "Starfish" design which is supposedly the best), but I strongly feel that how the food is aligned and whether you toss it during cooking makes the biggest differences. The landscape of customer reviews is also mixed. Some people love them, some hate them and some are neutral. The large body of people who complain are those that expected it to do something in the commercials that it doesn't. Again, an air fryer is mainly a convection oven with a smaller footprint. This one is obvious, but a major consideration. If you're going to be cooking for more than 2-3 people, you may want to consider getting one of the super big fryers like the Power XL Air Fryer or the Big Boss (even though it's not an air fryer). The bigger it is, the more tofu blocks you can fit. While most air fryers have similar temperature ranges, it's a factor you may want to consider. The lower you can go below 200F the easier it is to dehydrate certain things (namely veggies) without burning them. Some air fryers have buttons where you just press the dish you're going to make and walk away. Honestly, I don't think these are 100% necessary. Air fryers will usually have a temperature guide anyway so you can set the temperature of what you're cooking rather than pressing a pre-programmed button. Additionally, since most of the pre-programmed settings are for meat, I personally don't use them on my air fryer. Typically I'll simply use a higher temperature (around 350-375) for tofu and a lower temperature (around 200) for dehydrated kale chips and check it periodically like I would in a regular oven. Finally, cooking times will depend on the quantity so it's likely going to vary anyway, rendering the pre-programmed settings kind of useless. While most brands claim to have a warranty, it's the bigger brand names that are likely to honor them if your air fryer stops working. For the best picks, I made sure that there was some sort of online documentation for a warranty rather than just a claim to have one on an Amazon listing. The Power Air Fryer XL only has a 60 day warranty, but I still felt it was worth including because you get a good amount of capacity for the money. But be careful with warranties. They don't always cover everything on the machine and there can be a shipping/processing fee associated with getting the machine replaced/repaired. It simply depends on the company and what went wrong with the machine. And just note, Philips seems to have the least amount of defect/warranty issues from my quick survey of the customer review landscape. Finally, be careful when buying from 3rd party sellers on eBay or Amazon. Occasionally, this causes manufacturers to void the warranty. If you're unsure, consider getting the Protection Plan offered by retailers as they're usually pretty cheap. If you're getting an air fryer for convenience and a small footprint, you don't want to have to constantly be putting it in a pantry or kitchen cabinet. That's why you should consider getting a color and style that actually looks good in your kitchen - you'll be more likely to get the most out of your machine. Functionally, the NuWave Brio has one slight edge that I like over the Philips: the fact that it can get down to a lower temperature (100F). This is great if you're into slowly dehydrating fruits/veggies or are a raw foodie. It also tends to be priced lower for the size of air fryer that you get. Plus you have more color options. At the time of writing this though, most of the Philips Air Fryers on the market have been far better received than the NuWave models. Many people complain that there are quality issues with the Brio and that the machines break for a wide variety of reasons. The other issue that some reviewers have with NuWave is that the coating of the tray/basket starts to come off after some use. And according to one report, the pan isn't covered by the warranty and it would cost more to send it back for a replacement. 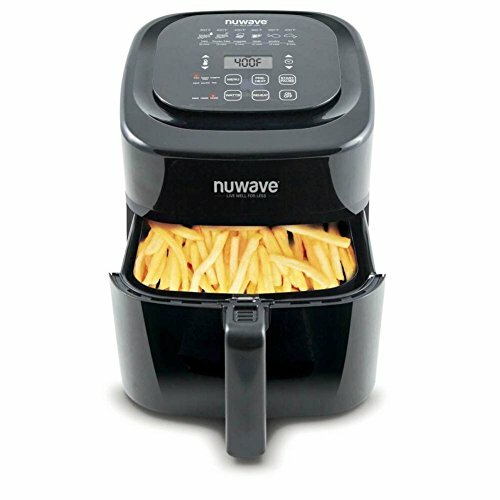 Much like the NuWave, the GoWise fryer featured here seems to have similar complaints of the non-stick coating peeling off. They aren't extremely widespread, but it's something to consider. But for me, there's two reasons why I might consider getting the GoWise over the Philips: cost and colors. At the time of writing, the GoWise units are just priced so much lower. In some cases you could end up paying half the amount for a bigger size. So even though there might be a slightly higher chance of issues with the GoWise you might be able to just replace it for a similar cost. Plus - you're more likely to find something that goes with the aesthetic of your kitchen. 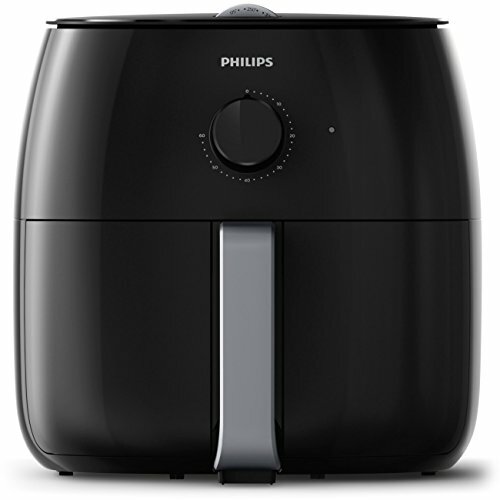 Just like the other Air Fryers, the Philips line aren't functionally all that different from the Power Air Fryer XL line. The upside to the Power Air Fryer XL is that you tend to get much more air fryer for the money (in terms of capacity). But the downside is that there seems to be more complaints on the Power Air Fryer XL just like the other models I've covered outside of the Philips. I've seen reported issues with rusting, peeling and sliding the basket back in. 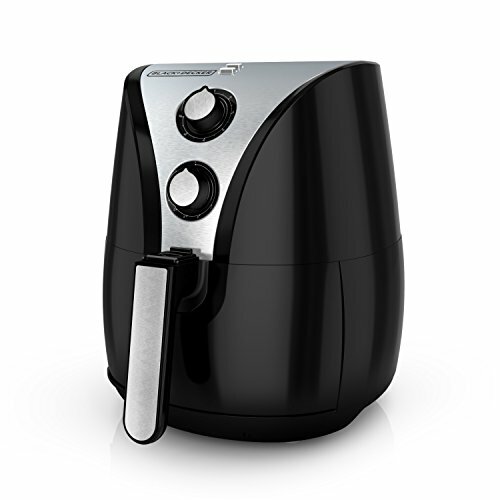 There's also a much shorter warranty on the Power Air Fryer XL - something you should consider before making the purchase - although you may be able to find additional protection plans depending on the retailer. 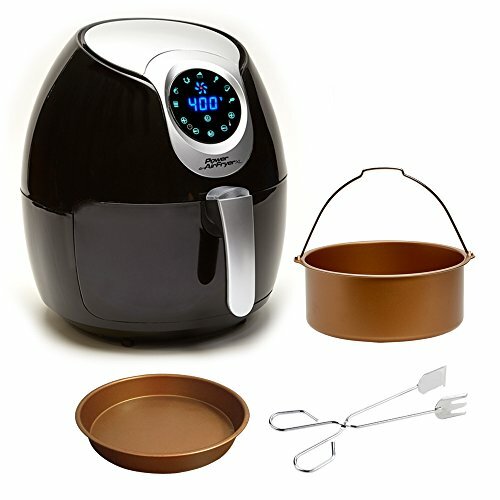 At this time, Farberware only seems to have one model of Air Fryer and it’s pretty basic (although most users are happy with it). It has a smaller temperature range than the NuWave (starting at 175F rather than 100F). The Farberware also uses an analog dial to select the temperature, which some people find to be imprecise. Both have reported issues of peeling on the non-stick basket. I personally think you get more value by going with the NuWave Brio. You get a bigger basket, a larger temperature range and an easier mechanism to select the temperature. But the Farberware might be enough if you want something smaller with no bells and whistles. The main difference I could find between the Power Air Fryer XL and the Farberware (aside from the size) are the digital controls. Users seem to much prefer the controls on the Power Air Fryer XL since it's easier to select the temperature they want. I couldn't find the official documentation on the warranty from Farberware, but most people state that it comes with a 2-year warranty. This is a lot longer than the Power Air Fryer XL's, but if you have the option to purchase additional retailer protection plans it's not really going to matter. Just like with the NuWave, get the Farberware if you want something affordable, small and without any bells and whistles. 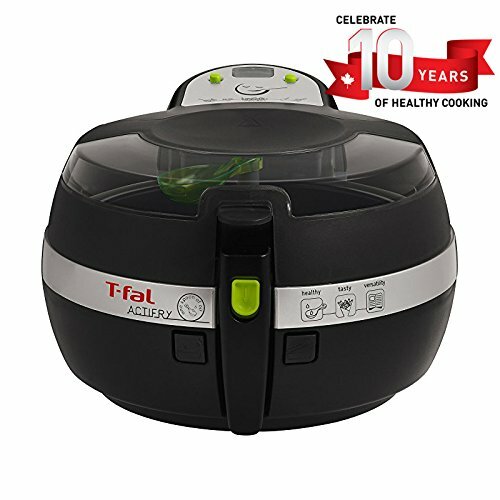 The T-Fal Actifry line is designed completely differently than the Philips Air Fryers. The T-Fal has a built in stirring mechanism which moves the food around while the air fryer is going. On one hand, the stirring paddle may break apart foods (like battered items) during the cooking process. On the other hand, it can be good for temperature distribution and great for things like stir fries. The Actifry also has a harder time getting things crispy as shown in this video. This is likely because the basket on the Philips models allows far more air flow or because the Actifry doesn't have any temperature settings. 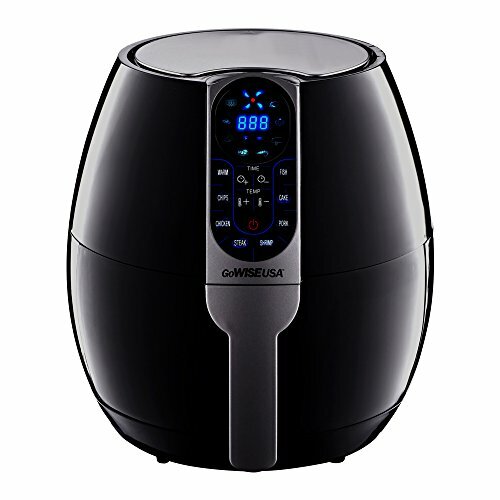 Top quality Air Fryer brand with the leading reputation and reviews. Simple to use analog controls. Good capacity for medium families. Wide range of temperature controls (starts at 100F). Easy to select temperatures with interface. Reported quality issues with non-stick coating on basket and accessories. Extremely affordable and great value. Easy to select temperatures and time with the digital interface. Reported issues with non-stick coating. Very affordable - within the budget of the average household. Longest warranty (2-years) of all the brands. Smallest capacity on the list. Large capacity at a decent price. Digital controls easy to use. Included accessories not that useful. Reported quality issues with non-stick coating peeling and getting the basket back in. The paddle-stirring mechanism is good for moving sturdy foods like veggies around and making sure things are adequately coated. Don't need to worry about shaking a basket. Comes with spoon to easily measure the oil you're using. Paddle can destroy delicate foods, especially if it has breading. No temperature settings - always at 338F. The fact is, most of these air fryers operate very similarly (aside from the T-Fal which is a totally different design). Philips seems to have the best overall reputation and leads the pack in terms of quality - so I'd recommend going with one of theirs if you have the budget. But I don't think you're likely to notice a difference with any brand you go with. Any slight difference in air-flow quality can be made up by tossing around ingredients in the basket during cooking. If you can't afford a Philips and don't need a huge capacity, the Black + Decker and GoWise units both bring excellent value. Finally, just be sure to consider whether you really need one if you already have a convection oven.